A Lockheed Constellation 1049H – the plane that ditched in the Atlantic on 9/23/1962. 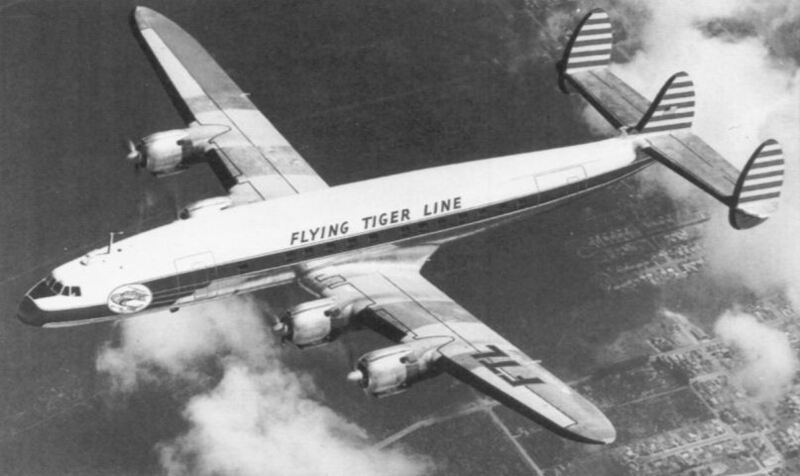 Until yesterday I'd never heard the story of Flying Tiger 923, a flight from New Jersey to Frankfurt, Germany that crashed in the Atlantic Ocean 500 miles off the Irish coast on September 23, 1962. What makes the story remarkable is that of the 76 people on board 48 survived. I stumbled across this story in a local Colorado newspaper, which had an article about one of the survivors. Fred Caruso is in Ireland to mark the 50th anniversary of his lucky escape. At first I thought it was possible the local Colorado paper had the story wrong, but a few minutes of Googling told me it was true. There was no shortage of links with information, including the cold, official government report into what happened. However, most of what's available comes thanks to Caruso. Caruso is using his web site FlyingTiger923.com to tell the story of Flight 923*. I can only imagine that Caruso thinks there's a story to tell here. I'm just amazed it's taken this long for it to be told (or retold as was a news item at the time). I can't believe it hasn't received the big Hollywood treatment. I don't know about you, but when I board a plane that is going to cross an ocean the one thought that never goes through my mind is that I might actually survive a catastrophic incident. The idea that something might actually go wrong with the plane and the pilot might have to improvise a landing strip occurs to me regularly, but never over the sea. I always assume that if something disastrous happens over the ocean that I'll be soon landing in the next life. Sure I know Captain Sullenberger managed it. He managed to land on water, but that was the Hudson River, not the Atlantic Ocean. Flight 923's Captain John Murray** landed his plane, mostly intact, on the ocean in waves up to 20 feet in height. It wasn't a smooth landing nor did everyone survive. The left wing tore off, the plane broke in half and 25 people were killed. It's still a tremendous feat, allowing more than half of the passengers and crew to live. A landing, safe or otherwise, in the middle of the ocean is a guarantee of nothing, other than that death has to be defied again. The plane was equipped with five life-rafts. However within seconds four of them were blown away, out of reach, gone. The one remaining life-raft was designed to carry 25 people, but 51 were alive in the freezing waters around the ditched plane. They all clambered aboard, some of the injured were helped by others into the overloaded inflatable raft. Then they waited. And drifted - nearly 22 miles from the crash site. The fact that there were far too many in the life raft meant it was cramped and uncomfortable, but probably saved them from freezing to death. After 6 hours the Celerina, a Swiss freighter that had monitored the SOS messages, found the floating survivors. A Canadian aircraft carrier, the Bonaventure, was also monitoring the distress calls. Despite the stormy conditions the naval ship's helicopters ferried medical supplies to the Celerina and removed the most severely wounded. Later, when the Bonaventure was near Ireland, the helicopters again transferred the wounded to Shannon Airport. The Swiss freighter arrived off the coast of Ireland two days after the plane crash. British helicopters removed the 17 remaining wounded. They were treated at Mercy Hospital in Cork. Fred Caruso was among them. He's back now to visit to mark the anniversary of those remarkable events and to thank those who helped him 50 years ago. The past few weeks our televisions have been full of dramas and documentaries on the extraordinary tale of the sinking of the Titanic. I would have thought these events on the Atlantic exactly 50 years after the Titanic would merit at least some attention from Hollywood. This is a great story and it needs a big audience. * Caruso has also published a book on the subject, Born Again Irish, the title of a reflection of the good fortune he felt to be alive in Ireland in September 1962. ** Captain John Murray moved to Ireland after the crash and flew out of Shannon Airport.